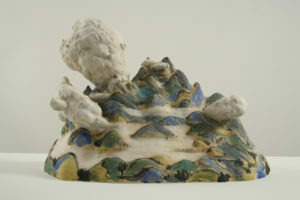 James Harris Gallery | Akio Takamori: "The Beginning of Everything"
James Harris Gallery is pleased to present an exhibition of new work by Akio Takamori titled “The Beginning of Everything.” The artist has been a seminal figure working in ceramics for more than thirty years. 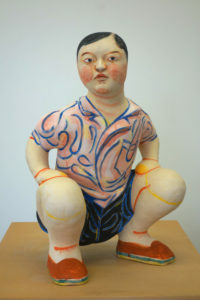 Takamori’s sculpture has always been figurative, yet it transcends its worldly resemblance through his keen ability to embody deeper metaphorical meaning that explores socio-cultural identity, human relationships, and iconographical forms. 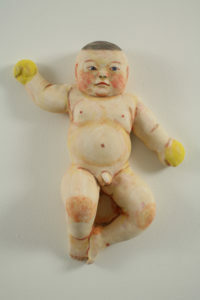 The smaller than life size scale of his work suggests the distinct realm that his figures occupy, the immortal realm of myth, culture, and perennial archetypes. For this show, the artist expands his visual vocabulary of images that incite the imagination and continues to unfold a narrative based on his exploration of psychological spaces. 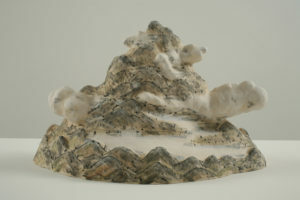 “The Beginning of Everything” includes stoneware sculpture of figures and landscapes as well as a series of prints that delve into the “belly” of the artist’s mind. 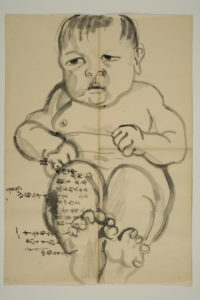 The exhibition is theatrically laid out, each piece staged to tell the ongoing narrative of Takamori’s artistic vision. 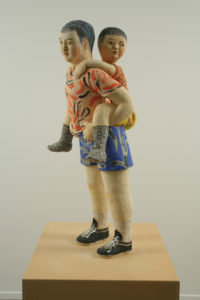 In the first room, two squatting boy figures look pensively in towards the rest of the show. The stoic gazes of these youthful characters penetrate beyond the room’s temporality and the painterly glazed surface of the clay gives them a fantastical context. Entering through this threshold, the scene is set to proceed with an active mind and a playful imagination. 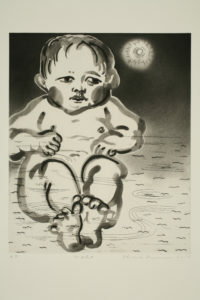 Takamori has often used the child figure in his work, which relates to the Japanese term Karako, the depiction of children as a metaphor for youth. For Takamori, youth is not a signifier of inexperience but rather as a refreshing optimism, where ideas and energies have boundless potential. 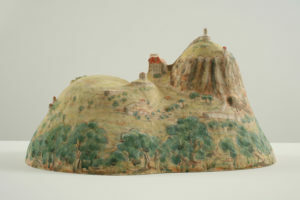 Also in this first room is a series of mountainscapes displayed on a twenty-foot long pedestal. With these works, the artist specifically recalls figures from his last show at the gallery entitled Groundwhere the backs of sleeping female figures suggested a mountainous landscape. 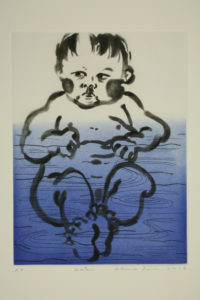 Takamori often plays with cross over or the gap between imagination and memory, a leitmotif throughout his career. 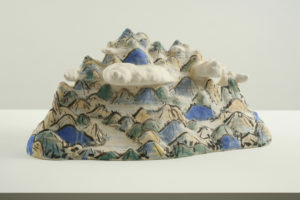 These underglazed stoneware scenes cloaked in clouds also recall varied historical traditions by drawing associations to the Greek Isles of classical traditions as well as Japanese Ukiyo-e prints, which mean “pictures of the floating world.” This is the second mountainscape series for Takamori, an earlier series from 2010 was paired with his Venus figures, encouraging that association with classical traditions. 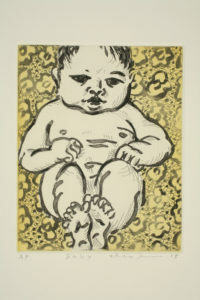 In the next room, Takamori explores the iconography of the baby through wall mounted ceramic sculptures and a suite of prints. In Buddhism, the very young are recognized for their close proximity to the other world, experienced again only at the end of life when we revisit this vulnerable and reliant state. 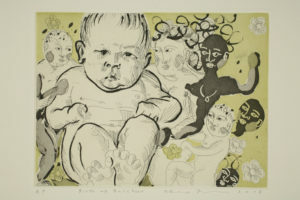 Witnessing the birth of his children and watching his parents age, Takamori recognizes the enigmatic and the other-worldly experience during these phases of life. 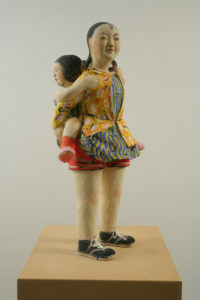 Takamori examines familial bonds often in his practice, and for this exhibition he has included a series of free standing children holding their siblings on their back, located in the final gallery. In these works, the artist demonstrates his painterly approach to the three-dimensional with his glazes by layering patterns upon patterns in bold colors that imbue his work with a baroque sensibility. The intense hues evoke a feeling of joy and youthful inventiveness. 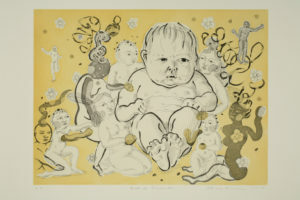 These painted figures have only an implied connection to the young, perhaps as their siblings or as symbolically related, representing the next stage of development and again referencing notions around aging and the cycle of life. 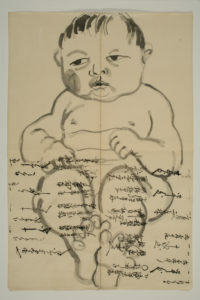 Takamori’s work is hard to place, both through his resistance to particularity and his interest in varied traditions. The dense volume and simplified form of the musculature along with Akio’s painterly approach to glazing echo this influence of classical sculpture of both East and West. The nuance of gesture references Greek Kouros, Renaissance sculpture, and Buddhist sculpture. His figures are images that have been severed from their origins and specific traditions, perhaps not so unlike contemporary cultural identities of today’s globalized society. 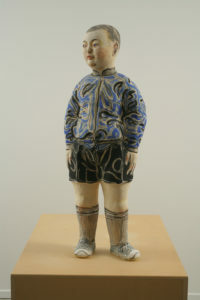 Takamori continues to push the boundaries of the ceramic medium and adeptly get at core human associations and relationships such that allows for a varied audience to recognize their own particular connection to his work. 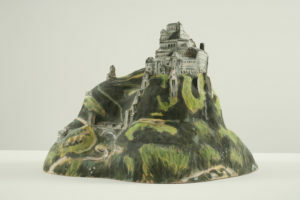 Museum collections include the Henry Art Gallery, Los Angeles County Museum of Art, Seattle Art Museum, Tacoma Art Museum, the Museum of Arts and Design in New York, the Nelson-Atkins Museum of Art in Kansas City and the Victoria and Albert Museum in London. 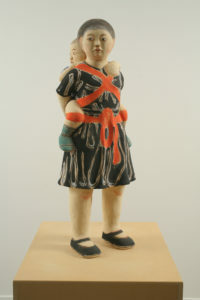 A mid-career survey exhibition of Takamori’s work, organized by Arizona State University’s ceramics Research Center, toured the United States during 2006. 28" x 20 1/2" x 15"
16" x 35" x 14"
11" x 18" x 9"
36" x 13" x 7 1/2"
29" x 22" x 5 1/2"
21" x 17" x 5 1/2"
18 1/2" x 22 3/8"
40" x 15" x 11"
41" x 21" x 16"
43" x 17" x 15"